Everything Is A Landscape (Or Not) 2. June 2014. Acrylic on canvas. 24 x 30 inches (61 x 76 cm). I have to confess, the World Cup has “parked the bus” in front of my easel! I simply haven’t been painting as much as I probably should lately. While I might deserve a yellow card for time-wasting, I did recently complete this painting, Everything Is A Landscape (Or Not) 2, an acrylic-on-canvas piece that measures 24 x 30 inches (61 x 76 cm). This painting is a remix of a painting I finished last month, shown below. I simply wanted to rework the composition, with some small adjustments to the square ribbon motif, in a completely different colorway. Everything Is A Landscape (Or Not). May 2014. Acrylic on canvas. 24 x 30 inches (61 x 76 cm). With summer right around the corner, now is a great time for me to take a step back from the easel and share with you images of seven new paintings, which I produced this spring. Most of the following paintings are already on view in my online portfolio — the Paintings section of this site — which now stands at 220 paintings. I can see exactly what Diebenkorn meant. Quite often, I will take a step back from one of my own sketches and see a landscape “into” it. No matter how hard I try, I just can’t avoid this perceptual phenomenon. However, in contrast with Diebenkorn, my approach to abstraction is informed by our highly graphic, design-oriented culture — notably product packaging. Therefore, the “landscape” I arrive at is a reflection of the landscape I live in — one that’s bestrewn with eye-catching graphic motifs. A companion piece to this painting is already in the works. I’m considering calling it Pure Painting Space. Looking Forward to Now was painted in mid-May, but was first sketched two months prior, with a rather sedate blue-and-brown colorway. As I embarked upon making this painting, I felt a need to crank up the colors. Looking Forward to Now. May 2014. Acrylic on canvas. 36 x 30 inches (91 x 76 cm). The lake a lilac cube. The Lake A Lilac Cube. May 2014. Acrylic on canvas. 40 x 40 inches (102 x 102 cm). You, Me, and the Interface, which I made in April, is painting that hasn’t yet made my portfolio. I’m still thinking things over. 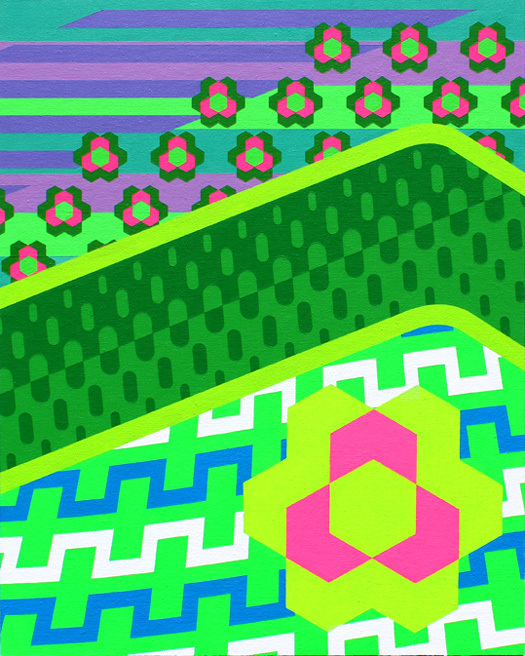 This ultimately was an experimental work that features a flourish of garish colors. Quite simply, I had an idea for a composition and simply ran with it. Whether I took the idea too far is still unclear! You, Me, and the Interface. May 2014. Acrylic on canvas. 20 x 16 inches (51 x 41 cm). Invisible Star Redux: Made for my nephew, Invisible Star 2 is a remix/reworking of a 2009 painting. So that I wouldn’t be painting the same work twice, this time around I updated the colorway. The background is light blue, rather than white. The burgundy has a deeper purple tint. The new composition’s orange is much more vibrant, with fluorescent orange added into the mix. Invisible Star 2. April 2014. Acrylic on canvas. 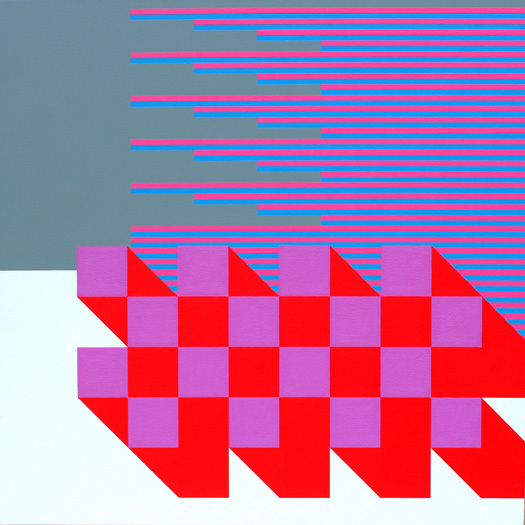 21.25 x 44 inches (54 x 112 cm). Two Minimal Studies: I also painted a pair of smaller minimal studies over the course of one weekend in April. I am quite fond of the graphic motif shared by these pieces. Here, I was simply exploring my options. Untitled Studies: April 2014. Acrylic on panel-mounted canvas. 12 x 12 inches (30 x 30 cm). Well, here’s to summer! I’m looking forward to having a prolific few months ahead. And if you subscribe to my blog by email, you’ll be among the first to learn about what I paint next! Until then, I hope you enjoy your summer. Lost in Space: 15-18 October 2013. Acrylic on panel-mounted canvas. 12 inches square (30.5 cm x 30.5 cm). I am extremely proud and excited to be one of 13 artists showing in Punchline, which opens Saturday, November 9 at The Institute Library in New Haven, Connecticut. This is perhaps my highest-profile show in the East Coast to date. Lost in Space (shown above) will be among the five paintings I’ll be exhibiting in Punchline. The title for this painting is a pun on the process of painting. As I produced this painting throughout mid-October, I definitely felt lost in the act of making. In fact, I scrapped the first attempt. On the second, the color palette changed several times, and it seemed as if I could barely hold onto the creative reigns, as paint layers built up. When this happens, a painting can go either way, for better or worse. Over the course of his lifetime, Pablo Picasso made nearly 2,000 paintings — and approximately 48,000 other works — according to one estimate. Picasso was so prolific, we still don’t know for sure the total number of paintings, sculptures, sketches, prints, and other works he produced during his lifetime. The numbers keep changing, as undocumented works keep reaching the market, keeping authenticators busy. Picasso’s lifelong relentlessness and tenacity for making new work has been on my mind a lot lately, as I recently achieved an important milestone of my own. The Paintings gallery of this site just reached the 200-painting mark, after I created pages for 13 more works. Overall, I estimate that I have produced perhaps 250 paintings since I started in December 1994. Several paintings still need to be added to my site. And many don’t quite make the cut, unfortunately! Regardless, the paintings I recently added — introduced below — span the Minimalism and Maximalism (Abstract) galleries of this site (what those terms mean is another blog post for another time), and have been produced 2010 onward. As I sit back and take a deep breath, all I can do is look forward to making another 200 paintings. Maybe one day I’ll reach the 2,000-painting milestone, like Picasso. But then again, Picasso didn’t have a web site to manage … and the glorious distraction of social media! 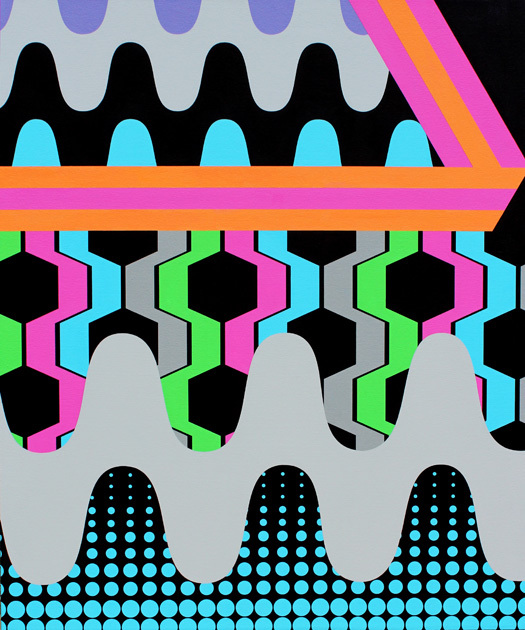 Showing in Origins in Geometry at Museum of Geometric and MADI Art Dallas: Optical Odyssey. 2012. Acrylic on canvas. 16 x 20 inches; 41 x 51 cm. I’m excited and honored to announce that I have been invited to show my work at the Museum of Geometric and MADI Art in Dallas, in the upcoming juried exhibition Biennial: Origins in Geometry. 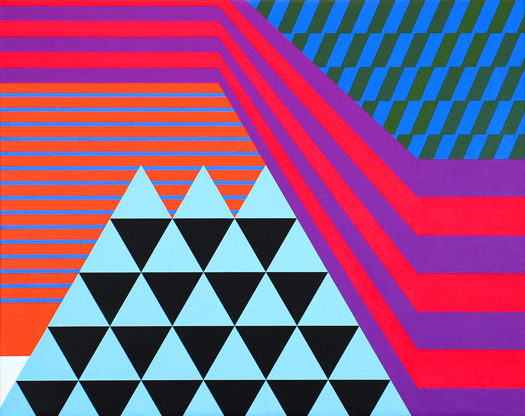 The painting selected for this show is Optical Odyssey, a vibrant geometric art work that I also displayed last summer in the Vivid Visions exhibition in Portland. Biennial: Origins in Geometry will be on view from July 19 through October 6. 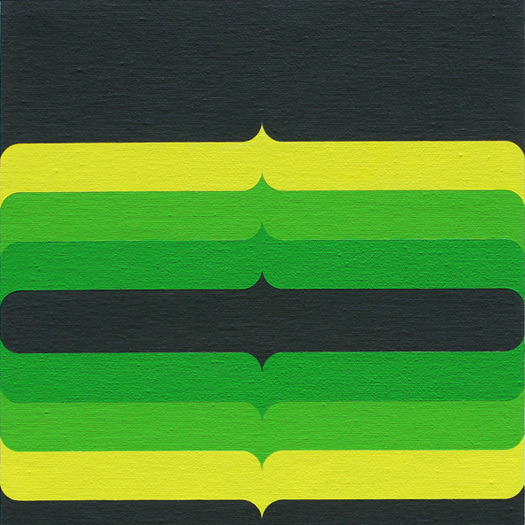 The exhibition aims to “recognize excellence in emerging visual artists deriving inspiration from geometric abstraction.” A catalog will accompany the show. The curator of Biennial: Origins in Geometry is Clint Willour, who has served as curator at the Galveston Art Center for the past 19 years and is active on boards of numerous arts organizations in Texas. To see other works like Optical Odyssey, I invite you to visit the Maximalism gallery of my site’s Paintings section. Next show: 2007 Arizona Biennial; Third Arizona Biennial in a row! 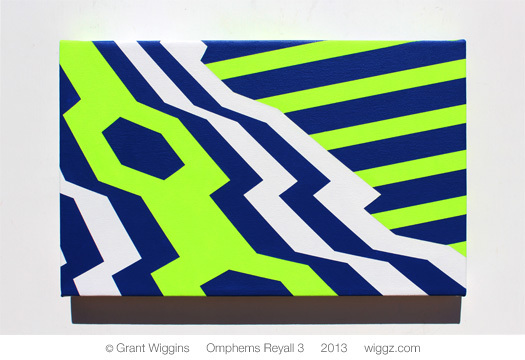 Graphic geometric art: New painting by Grant Wiggins, Omphems Reyall 1. 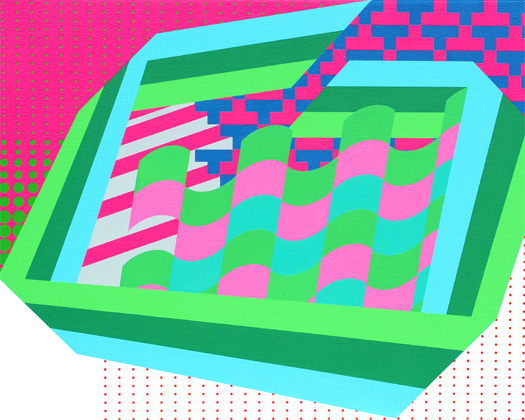 Graphic geometric art is really what I love to make, and it’s really what inspires me to keep innovating artistically. My take on, or version of, graphic geometric art places emphasis on geometry — dynamic, visually charged compositions — but affords room for negative space, to achieve a balance. The result is a balance between minimalism and design-inspired maximalism. 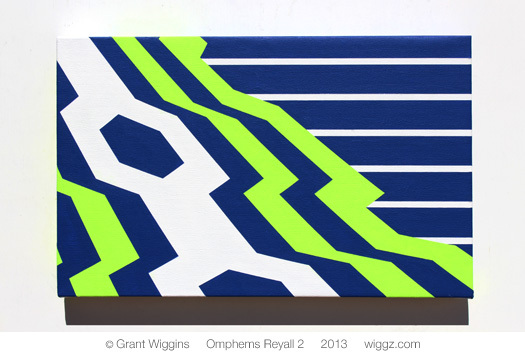 That said, the newest addition to my portfolio is a series of three graphic geometric art works titled Omphems Reyall. 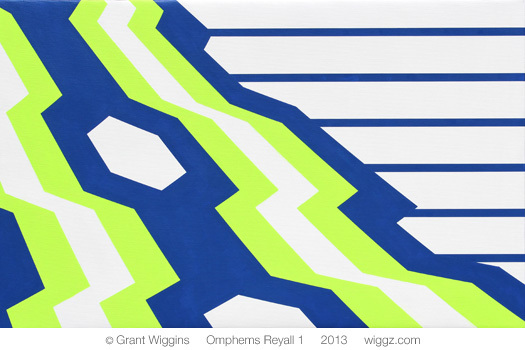 The first painting in this series measures 20 x 32 inches (51 x 81 cm). The following pair is of paintings each measure 10 x 16 inches (25 x 41 cm). 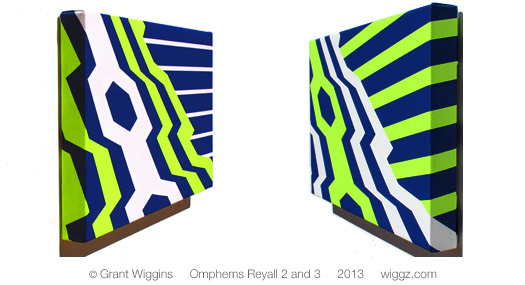 Omphems Reyall 2 and 3, respectively. 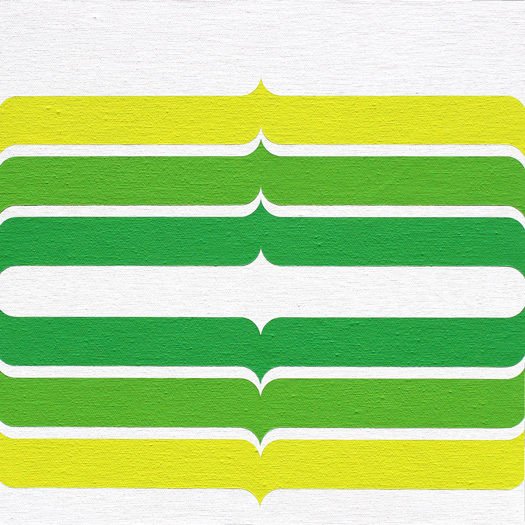 The invented word “Reyall” in the title is a pun and reference to Real Madrid football club, whose away jersey for the 2012/2013 season (below left; via realmadridshop.com) is the inspiration for this series’ color combination. 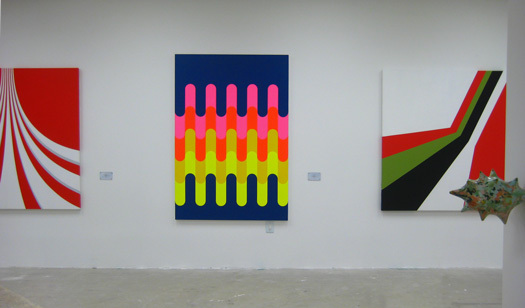 As these graphic geometric art works began to take shape, the colors also reminded me of the paint scheme for the Subaru Impreza WRX rally car (below right; image via Ericd on wikipedia.org). Hexagons, stripes, and geometric patterns — I just can’t get enough of them! There’s plenty of time to see the Beyond Minimalism art exhibition I’m a part of at Hudson|LINC Gallery. The show will be on view through Friday, May 3. Opening night, held March 19, was well attended. 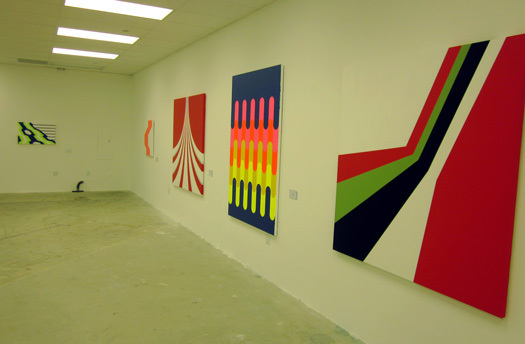 Los Angeles artist and designer Sacha Baumann in a very nicely done blog post describes Beyond Minimalism as “really good — bright, playful, tactile,” and offers several interesting glimpses of my paintings on opening night. Hudson|LINC is open Monday through Friday, 11 a.m. to 4 p.m. and by appointment. The gallery is located on the second floor of the Pacific Design Center’s Blue Building. More at hudsonlinc.com. Paintings I will be showing at Parallax Art Fair New York, November 16 – 18, 2012; see links below for details about these paintings. I cordially invite you to view my work in New York this month, at Parallax Art Fair New York, held November 16 through 18 at the Prince George, 15 East 27th Street, Manhattan. A private VIP viewing will be offered Friday, November 16, from 7 to 9 p.m. The show will be open to the public the weekend of November 17 – 18 from 11 a.m. to 5 p.m. For free passes to the weekend dates, visit http://parallaxartfair.eventbrite.co.uk. You’ll be able to find my work in Gallery 25. Look for the fluorescent orange, pink, and chartreuse paint. You can’t miss it! After hosting several art fairs in London, Parallax debuted in New York this past August, presenting works by more than 180 artists from 30 countries. For this upcoming edition of Parallax Art Fair New York, more than 200 artists are expected to exhibit between 2,000 and 3,000 works of art. My current group show, Vivid Visions, opened in Portland last night. Above are the first images I’m able to share. Thanks to my good friend — and fellow Vivid Visions artist — Spencer Hibert for graciously furnishing these photos. The complete collection of works on view in the show is now available at Compound Gallery’s web site. I sincerely invite you to check out this online catalog. In addition to my own six paintings, you’ll find an impressive collection of imaginative works by Arbito, Buff Monster, Oliver Hibert, Spencer Hibert, and Martin Ontiveros. Lots of tripped out colors and imagery! I will be adding more installation photos of my work as they become available. 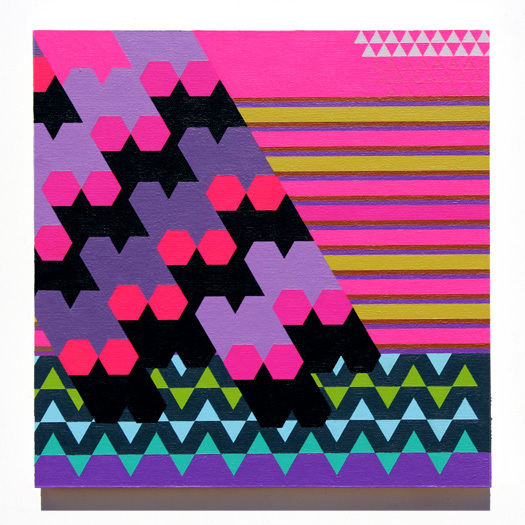 Abstract acrylic art: Paintings I’m showing in Vivid Visions are decidedly pop art-inspired. Above, from left to right, are Psychoactive Snack; Information Overlord; The Future, Multiplied by Today; Purple Protocol; Active Receptor; and Optical Odyssey. The five framed paintings measure 12 inches square (30 cm), plus frame. The sixth is 16 inches tall by 20 inches wide (41 x 51cm). All paintings were made between May and July 2012. The list of abstract acrylic art paintings I’m set to show in the upcoming group show Vivid Visions is now complete, and the paintings are on their way to Compound Gallery in Portland. In all, six paintings are on their way to the show, which is curated by my great friend and fellow Arizona artist Oliver Hibert. Compound in Portland features a ground-floor retail store that specializes in apparel, shoes, accessories, and housewares. Compound Gallery is located on the second floor. 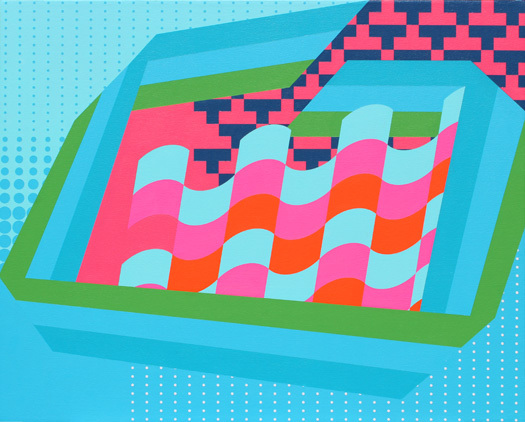 Vivid Visions opens at Compound Gallery on Thursday, August 2. It will remain on view through September 1. Other artists exhibiting in Vivid Visions are Buff Monster, Jesse Hibert, Oliver Hibert, Spencer Hibert, Martin Ontiveros, and Pinky. Read more about the artists on compoundgallery.com.